So what do you want from your Virgin Islands Vacation? The islands offer a fantastic array of vacation choices from relaxing and laid-back to fast-paced and exciting, with everything in-between. Who's going: are you a couple, a family with kids, a group, or traveling by yourself? Would you like to stay in one place or explore the different islands? What sort of accommodations suit you? Would you prefer to dine in restaurants or cook your own meals (or both)? Start by deciding how long you'll be spending in the Virgin Islands. Vacation planning begins here. The length of your stay in the Virgin islands is one of the most important factors in determining your overall vacation plan. For some suggestions on how to plan your trip based on the length of time you'll be staying, click here. Obviously, the make-up of your traveling group will determine to a large degree the nature of your Virgin Islands vacation. Consider the nature of your group and the personalities and expectations of the people to create a workable Virgin Islands vacation plan. To learn about making your plans according to your traveling group, check out this page. Stay put or move around? This is really a matter of personal preference, as well as how long your trip is (as I mentioned above). I'm a big believer in exploring the different islands, and the different kinds of accommodations and different places on each island. However, I know folks who just want to go to one place and stay there... I even know of people who go to a resort and never leave the grounds for the entire trip! That said, I think you're doing yourself a disservice by not checking out different places, especially if it's your first trip to the U.S. Virgin Islands. Vacation variety like this can really add a whole new dimension to your trip. For a more detailed discussion on moving from place to place in the islands, check out this page. Again, this is very much a matter of personal preference. Of course, your budget will also be a major determining factor in where you want to stay in the U.S. Virgin Islands. 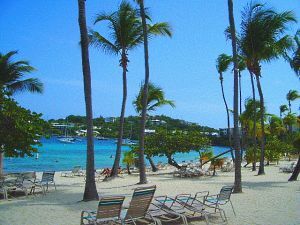 Click here for an overview of accommodations in the Virgin Islands. Dine out or cook your own meals? You'll find tons of great eating choices on your U.S. Virgin Islands vacation. Pretty much every kind of restaurant is available, from moderately priced to ultra-expensive. Unfortunately, in general food in the Virgin Islands is expensive, because almost everything has to be shipped in. You can save some money by cooking at least some of your meals for yourself. To cook for yourself, choose accommodations that offer kitchens. Lots do, especially condos and private villas. There's nothing wrong with eating out all the time, if that's your preference, but keep in mind that you'll need to spend more money to go that route. My recommendation is to try to do a combination, unless you're dead-set against cooking for yourself while on vacation. You'll have a huge array of choices for activities on a Virgin Islands vacation. Again, personal preference and the people you're traveling with will be key to your choice of activities. The length of your stay and your budget will also be a major factor in deciding what you'll do. For a list of activities available in the Virgin Islands, check out this page.